In a time of war, sometimes battles take place in the heart. Tess Beaumont is tired of being thought of as just a pretty face. Eager to do her part for the war effort, she joins the Navy's newly established WAVES program for women. Perhaps there she can convince people that there is more to her than meets the eye. Lt. Dan Avery has been using his skills in the fight against German U-boats and hoping to make admiral. The last thing he wants to see on his radar is a girl like Tess. Convinced that romance will interfere with his goals, Dan is determined to stay the course, no matter how intriguing a distraction Tess is. But love, like war, is unpredictable. When Dan is shipped out at the peak of the Battle of the Atlantic, he finds himself torn between his lifelong career goals and his desire to help the beguiling Tess root out a possible spy on shore. Could this fun-loving glamour girl really be the one? When Tides Turn is the third book in Sarah Sundin's Waves of Freedom series. I have enjoyed reading and reviewing the first two books in this series, Through Waters Deep and Anchor in the Storm. When Tides Turn is set in 1940's Boston. As the book opens, Tess Beaumont is working at Filene's, and hoping to use her business degree to get ahead in retail management. Unfortunately, she finds she is judged just as a pretty face. In frustration, and longing to do something meaningful, she joins the WAVES. Tess finds her work with the WAVES both challenging and exciting. She becomes involved in a mystery involving a possible spy in Boston. Tess also spends time with a handsome Navy man named Dan Avery. Tess and Dan are opposites. She is warm, fun loving, and gregarious, while he is serious minded and so strongly career driven that he has a hard time taking time off and socializing. I loved these characters. They were both admirable but very human. I was really pulling for them in this book to work things out so they could have a future together. Sarah Sundin is one of my favorite historical fiction writers. The 1940's details of her books, including When Tides Turn, are exceptional. I love the 1940's, and really feel like I am immersed in the time and place when I read her books. The characters are all very well drawn. It was wonderful seeing favorites from the other books in this series in When Tides Turn, including Mary, Jim, Lillian, Arch, and Yvette. I love the way faith is addressed in this book, as a source of strength in times of trouble and a source of joy in times of happiness. 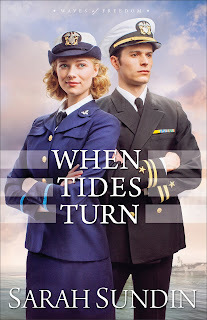 I highly recommend When Tides Turn, and the whole Waves of Freedom series, to other fans of historical fiction, and especially to anyone who loves a World War II setting. The only thing I didn't like about this book is that it ended! I loved the setting and the characters that much, and wish the series could go on and on. Sarah Sundin is the author of Through Waters Deep and Anchor in the Storm, as well as the Wings of the Nightingale and the Wings of Glory series. A graduate of UC San Francisco School of Pharmacy, she works on-call as a hospital pharmacist. During WWII, her grandfather served as a pharmacist's mate (medic) in the Navy, and her great-uncle flew with the US Eighth Air Force. Sarah lives in California. Visit www.sarahsundin.com for more information. I received a copy of this book from Revell Reads. Thank you so much for the lovely review! I'm so glad you enjoyed Dan & Tess's story!